How many times have you chosen the same old wine - just to be safe? Have you ever stood in front of a supermarket shelf of wine and not known which to choose? Wouldn’t you like to learn more about wine, get to taste different types of wine and have them conveniently delivered to your home? Did you answer ‘yes’ to any of these questions? So, what is the best way to solve this problem without the risk of trying lots of ordinary and expensive wines? Easy... Our panel blind tastes over 2000 wines a year to make sure you receive the very best (blind wine tasting ensures no judge is influenced by a label or the beauty of a wine farm or warmth of the host). Choose your selection below and start discovering new wines today. Looking for the perfect wine to drink this Autumn? 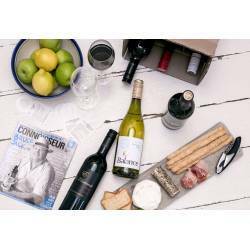 Get 12 bottles delivered to your door 4 times a year (Summer, Autumn, Winter & Spring). The Panel curates and selects these wines, firstly from the best scoring wines from their weekly blind tastings and secondly by which wines are best suited for the season we are heading into. There are 3 selections you can choose from Premium, Cellarmaster and Best Value. 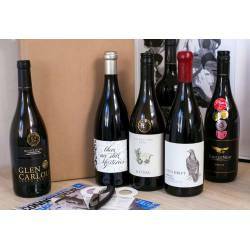 All the wines are panel-selected and are conveniently delivered direct to your door. Cancel, pause or change your Club when you like. * No questions asked money back guarantee. Looking for your next Dining Room Show Stopper? These are some of the best wines South Africa has to offer, with price tags to match. You can choose whether you would like to receive 6 or 12 bottles every 2nd or 3rd month. Need more? Simply add a second to your Cart. The Platinum Wine Club is based on a price parameter system. I.e. Your pack will never be higher than the stated amount (view Price tab) … this gives our panel the flexibility to choose the very best for your selection. The Reserve Wine Club is a unique Club … all our Club wines are panel selected by our panel of 12 independent wine judges in weekly blind tastings, butThe Reserve Wine Club has 1 more very special criterion … for a wine to be selected into this Club it must have ranked 1st in the blind tasting. The wines you receive all scored 1st out of at least 20 wines in our panel’s blind tastings. Sign up today to enjoy All the Winners! The Reserve Wine Club is based on a price parameter system. I.e. Your pack will never be higher than the stated amount (view Price tab) … this gives our panel the flexibility to choose the very best for your selection. The Wine-of-the-Month Club is the “founding” Club … where it all started and our namesake. For over 33 years the panel have been selecting the very best South Africa’s wines for The Wine-of-the-Month Club. Each week the judges taste, by category, 80 different wines (over the year, more than 3 200). They taste the wines blind. That is, they don’t see the labels. They don’t see the prices. They are not told the names of the producers, or where the wines come from. They look for one thing, and one thing only: quality in the glass. Where two or more wines achieve the same scores, the Club selects the wine with the lowest price. The Wine-of-the-Month Club is based on a price parameter system. I.e. Your pack will never be higher than the stated amount (view Price tab) … this gives our panel the flexibility to choose the very best for your selection. The wines the panel taste are all blind tasted. What is the purpose of this? The panellists cannot be influenced by a producer’s clever advertising or skilful marketing, or even its winemaker’s past reputation. They look for one thing, and one thing only: quality in the glass and where two or more wines achieve the same scores, the Club selects the wine with the lowest price. Often a R100 bottle of wine will beat a R500 bottle of wine. And these are the wines the panel selects for The Best Value Wine Club. The Best ValueWine Club is based on a price parameter system. I.e. Your pack will never be higher than the stated amount (view Price tab) … this gives our panel the flexibility to choose the very best for your selection. Looking to learn more about wine in the comfort of your own home? The Wine Appreciation Course/Club is the perfect Club to join to begin your wine journey. With each delivery, you will receive a module that you can keep and file, until you have the completed course. By the end of the course you would have found you havesuddenly become a wine connoisseur, all in the comfort of your own home. You can expect to get modules with information about how to open a bottle of wine correctly, how to taste wine, wine etiquette, the winemaking process, how and when is the best time to pick grapes, the different types of wine, what is Brandy, what is Port, how to store wine, how to match food and wine, wine producing countries and their wines and much more. If you sign up for a lifestyle club online, you will only be billed when your choice of club runs again.. Please continue with checkout process as usual.